I really wanted to have David Bowie on this countdown, because he likes costumery and fun, and I enjoy him as a musician and a spectacle of humanity. I cannot, however, arbitrarily slap down a David Bowie post. There has to be some connection to the wide theme of nerd-dom and Dragon*Con and fan-ocity. 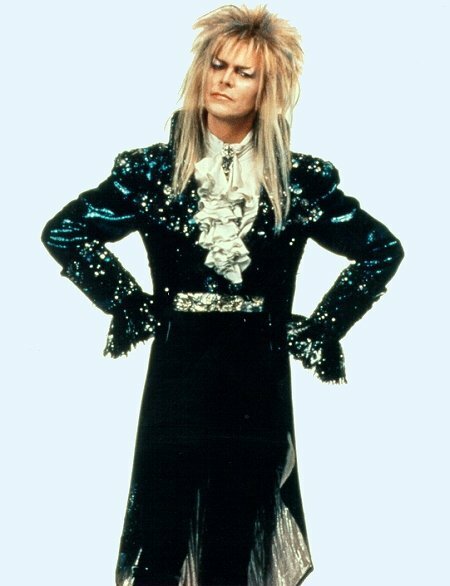 And then it occurred to me: Labyrinth, duh. We’re not going to talk about OSCAR WINNER Jennifer Connelly’s not-so-Oscar worthy acting. She was super young, her eyebrows were working against her, and I imagine that being in the presence of DAVID BOWIE would make anyone look shock- and-awed. Allright, mission accomplished, Bowie has been utilized. And just for fun, here’s a clip from Flight of the Conchords! Labyrinth AND space. Double trouble.